Selenium is a naturally occurring element that is widely but unevenly distributed in the earth’s crust and is commonly found in sedimentary rock. Federal and state governments regulate levels of selenium that can be present in soil and water to protect against possible negative health effects. In various parts of the Denver metropolitan area, elevated concentrations of naturally occurring selenium are present in groundwater. Selenium-impacted groundwater cannot be discharged to surface water above stream segment discharge standards like rivers and streams, as these water bodies are regulated in Colorado under the Construction Discharge Permit System by the Colorado Water Quality Control Commission (CWQCC). The Forum Real Estate Group (client) developed a multi-story apartment complex with a below-grade parking garage on a site that had elevated selenium in relatively shallow groundwater. The building was designed with an under-slab and perimeter groundwater collection system that routed water to a sump collection vault for discharge. Testing at the site showed concentrations of selenium present in the groundwater were above the allowable discharge standards for the local receiving stream. The client hired a water treatment contractor to design a treatment system that would reduce the levels of selenium to below the stream segment discharge standards. 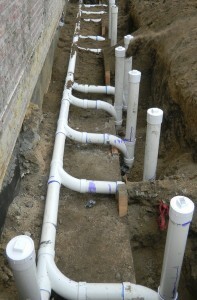 The resulting system included discharge piping that would convey the groundwater to a discharge point near the property line and into the storm-sewer that discharged into Cherry Creek, a local stream regulated by the CWQCC. The filtration system implemented by the water treatment contractor also involved the frequent replacement of expensive filters due to the levels of selenium and other particulates collected in the sump. After months of testing, the system did not adequately treat the selenium-impacted groundwater to below stream segment discharge standards. This posed a challenge to the client, as construction would be complete in one month and tenants would begin moving in to the building. A Certificate of Occupancy could not be issued to the client due to the selenium issue in groundwater discharges from the site. The client faced a big challenge that required a long-term plan for managing elevated selenium levels before the building could be occupied. The client called Terracon, and our environmental “solutions team” took control of the situation. Denver’s environmental and geotechnical design team initiated a pilot test at the site, and installed three pilot groundwater injection wells. The injection well is a vertical pipe installed in the ground that facilitates the movement of injected groundwater through permeable layers in the soil and bedrock. Terracon also performed infiltration tests to establish a design basis for the number of injection wells that would be necessary to handle the anticipated flow rate collected from the under-slab and perimeter drain systems of the building. Based on the results of the pilot program, the system design consisted of an injection well gallery to facilitate the gravity injection (infiltration) of the groundwater that was collecting in the building under-slab and perimeter drain systems back into the subsurface. The injection well system design addressed the potential for frost, increased flow rate, and provided for future access should additional maintenance and monitoring be required. The system not only addresses selenium, but also lead, iron, and other problematic metals and constituents that can present long-term maintenance and dewatering issues for a building. Using the USEPA Underground Injection Control permit system, a total of ten 4-inch diameter injection wells were permitted and installed using a hollow-stem auger drill rig to depths of approximately 30 feet below ground surface. The screened section of the injection well was installed in the groundwater bearing zone at the site to facilitate the infiltration of the injected water into the subsurface. The depth of the well screen interval eliminated the possibility of recirculating the infiltrating groundwater back into the building underdrain. In summary, using the under-slab and perimeter drain systems from the original design allowed the selenium-impacted groundwater to be collected and routed into the sump vault in the subgrade parking garage for discharge to the storm sewer. Terracon’s design re-routed the water from the sump directly to the injection well gallery where the groundwater would infiltrate into the subsurface, completely eliminating the need for frequent filter replacement, expensive water treatment, discharge water sampling, and basic operation and maintenance costs. Terracon delivered an innovative technical approach, building on previous successful projects, difficult site conditions, and extremely compressed timeframes. The conceptual design idea is that re-injection can work for a variety of different water quality issues. Terracon’s integrated approach using both geotechnical and environmental technical expertise helped the client implement a long term solution for a critical and costly problem. Consequently, the client contacted Terracon for another project requiring a similar solution. This innovative and successful project exemplifies Terracon’s “Three R’s” in action: Responsiveness, Resourcefulness, and Reliability.